Biobased chemicals on a slick and oily path| Global Market Insights Inc.
Biomass pretreatment technologies such as steam explosion, acid treatment (dilute as well as strong acid), alkali pretreatment, ammonia explosion, ultrasonic treatment, enzymatic, have been under exploration. As off today, there is no ultimate universal solution on pretreatment, although there has been substantial knowledge gained in this area. Especially, enzyme players such as DSM, Novozyme, DuPont have made tremendous progress on controlling overall enzymatic treatment cost. On one side biotechnology progress in production of enzymes has helped in bringing cost of enzyme down while simultaneously better understanding of how they react with complex biomass substrates has enabled choosing the right cocktail and appropriate dosage requirements. As the industry was making new technology breakthrough on cellulosic ethanol front, the economic meltdown in 2008 posed new feasibility challenge, more like a survival challenge. Chemical companies started focusing on exploring biorefinery concept more seriously, the idea was to leverage part of capital infrastructure to produce fuels, chemicals and polymers in the same complex, something that the petrochemical companies traditionally were very good at. It was a new greener, cleaner and economical approach to produce bulk & specialty chemicals. The USDOE Report, 2006 on platform chemicals became new the Bible for the industry. Several ‘cradle to grave’ and ‘cradle to cradle’ studies carried out in the U.S. and Europe indicated the benefit of Biorefinery approach. We saw renewed interest in lactic acid technology. Cargill re-tuned its technology with low pH yeast to produce lactic acid which was better for Polylactic Acid (PLA) production. Other companies such as CSM, UDHE, Purac-Corbion, followed the same path to commercialization. We saw more efficient metabolically engineered bugs from Metabolix for production of Polyhydroxy Alkalonates (PHA). 1-3 PDO from Glycerol and later from sugar has commercialized by DuPont. BioSuccinic acid became commercial reality and companies such as Reverdia, Bioamber, Myriant are now producing BioSuccinic acid at commercial scale at a cost competitive rate than their petrobased competitors. We saw new partnerships emerging to deal with feedstock challenges and downstream know how. These alliances, between agro processing feedstock companies, chemical companies, and polymer companies not only bridged the value chain gaps but also accelerated commercialization by eliminating /reducing the risk in new technologies. Later new molecules joined the race. Some of these were drop in replacements like Bio Acrylic acid (OPX Bio) , Bio Adipic acid (Verdezyne, Reverdia) and Isosorbide (Roquettte), Itaconic Acid (Itoconix) while some of these were novel molecules like FDCA (Avantium), Farnesene (Amyris). These novel molecules were pursued with great interest as they brought tremendous commercial opportunities. New technology dimensions were opened by synthetic biology approach deployed by Genomatica. New pathways were created in yeast and bacteria to produce platform chemicals such as 1-4 BDO, Biobutadiene, MEK, with each representing a multibillion dollar market opportunity. 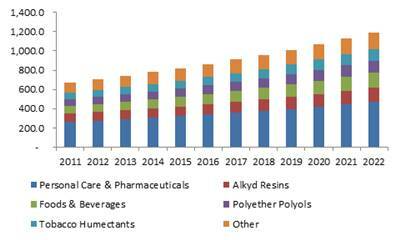 We saw rising interest in BioButanol, first as Biofuel but later as platform chemical. The Biobased industry went through a second major shakeout with the U.S. Shale gas/Oil revolution. Now it was cheap to produce C2-C3 chemicals like polyethylene, propylene and derivatives from shale gas. Effort to produce Bio PET from ethanol went on the back burner. There was substantial dip in the interest on 3 HPA route to Bio Acrylic acid. On the other hand new opportunities were created in C4-C5-C6 chemicals. We saw new routes to produce Biobutanediol, Butadiene, Isobutene, Adipic acid. Companies like LanzaTech found feedstock agnostic routes to produce fuel and chemicals by fermenting gases like CO, CO2. European companies like VITO pursuing recovery of C4 Chemicals from industrial effluent streams. VC money followed companies pursuing these platforms. Today as we speak there are close to 90-95 biobased chemicals under exploration. The cellulosic ethanol story saw a second coming with technology breakthroughs as well as backing of government mandates and subsidies. Today, as we speak to industry participants, investors, bankers and especially students the undertone is very subdued. Everybody is concerned with low oil prices and its adverse impact on growth of Bioeconomy. Although high crude oil price was one of the most critical drivers in creating biobased industry, there are many other factors that still support development, commercialization and proliferation. We believe, going forward, other drivers that are still intact will prevail in short to medium term till we see a cyclical uptrend in crude oil prices.